Crop Guard Anarak SM is used as a foliar spray to effectively combat and get rid of certain causes of leaf spots. Anarak SM also helps plants to heal the damage caused to plant leaves by this kind of leaf spotting. Crop Guard Anarak SM is a natural product and will not damage, stall or suffocate your plants. Please give us a call for more information regarding this product and the types of plant problem that Crop Guard Anarak SM can help deal with. Crop Guard Anarak SM rids your plant of the causes of leaf spotting Helps your plant to heal the leaf spot damage. Fast acting and effective Concentrated –.. Sometimes, plants can develop white powdery spots and clumps on their leaves or stems which just seem to spread uncontrollably. Crop Guard DustOff PM gets rid of the problem in one quick, easy treatment. Great for times when your normal preventative measures have failed! Crop Guard DustOff PM gets rid of white powdery spots & clumps Helps prevent crop damage due to certain conditions. Fast acting and effective Concentrated – use diluted as a foliar spray Crop Guard – DustOff PM Contains: 250 millilitres of Crop Guard DustOff PM concentrate How Crop Guard – DustOff PM Works: Crop Guard DustOff .. If you notice the leaves on your plant becoming discoloured and silvery or see marks like scratches, Crop Guard LaminAid TH may be able to clear it up! Crop Guard LaminAid TH gets rid of the problem in one quick, easy treatment. Great for times when your normal preventative measures have failed! Crop Guard LaminAid TH stops leaves becoming discoloured & silvery Helps prevent crop damage due to certain conditions. Fast acting and effective Concentrated – use diluted as a foliar spray Call us for more information about this product Crop Guard LaminAid TH gets stops the spread of discolouration and silvery marks on your p..
Keeping your flower-buds healthy can be difficult, particularly when your flower-buds have become large and dense. Crop Guard Bud Buddy BR helps to combat the main problem that can arise under these conditions. Please call our shop for advice regarding this product and the problems that it can deal with. Crop Guard Bud Buddy BR helps to keep large, dense flower clusters healthy Helps prevent crop damage due to certain conditions. 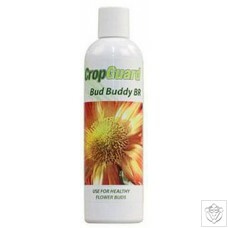 Fast acting and effective Concentrated – use diluted as a foliar spray Call us for more information about this product Crop Guard – Bud Buddy BR 250Mls Contains: 250 millilitres of Cro..